Sacred smoke created from burning medicinal or sacred plants is an aspect of many cultures and religions the world over. In North America, it is a practice common to Indigenous Peoples and is called smudging. Many, but not all, Indigenous cultures in Canada smudge but may have different beliefs associated with the smoke, and different ceremonies and protocols. In this article we are giving a general definition of smudging. 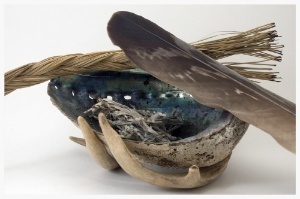 The four sacred plants (cedar, sage, sweetgrass, tobacco), gifts from mother earth, represent the second element. Some school districts are recognizing smudging as necessary for their Indigenous students and have written guidelines and protocols for schools to follow. Smudging ceremonies are also used to educate non-Indigenous students about Indigenous culture and beliefs. When it comes to developing guidelines and protocols for smudging within a health or education organization it is recommended that the guidelines and protocols be developed with the input of Elders from the surrounding communities. If you are invited to participate in a smudge and are unsure of protocols ask the person who invited you and failing that, watch closely and follow what others are doing. Understanding the historical and ongoing impacts of the Indian Act is a key component for reconciliation. This slim little book provides that understanding. You can order your copy by clicking the book cover image.